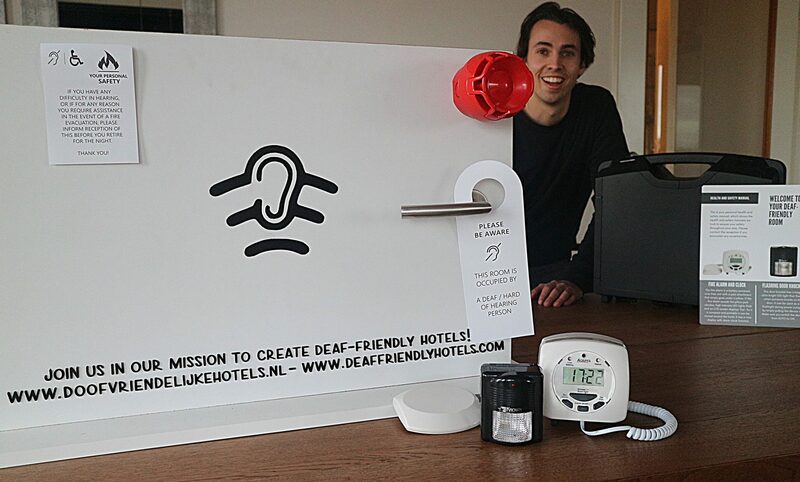 A new organisation set up to encourage hotels to become more deaf friendly has chosen the Agrippa Pillow Alarm to show hotels how easy it is to make adjustments to their services to attract more customers. Heary, based in the Netherlands, which offers training and products to the hotel industry, has undertaken research suggesting the majority of hotels offer no additional options for those who are deaf or hard of hearing, in the event of a fire evacuation. Robert Schouten, the director of Heary founded the company while studying at Hotelschool The Hague. During his work experience in hotels, he became aware that the service provided by hotels for people with hearing difficulties could be vastly im proved. The portable Agrippa Pillow Alarm notifies the user if the fire alarm sounds by vibrating under the guest’s pillow, which is triggered by its signature listen and learn technology that learns the sound of the alarm. Robert Schouten, said: “We chose the Agrippa Pillow Fire Alarm as it was by far the best product available on the market. The product works very well and is a perfect addition to our product range that gives hotels the ability to support their guests with hearing loss. “We would recommend these units above other alternatives; they are much lighter and their listen and learn technology means the end user feels safe with a low risk of false activation. Each device has a smart carry bag which allows the hotels to store the devices safely and provide to guests during check in.